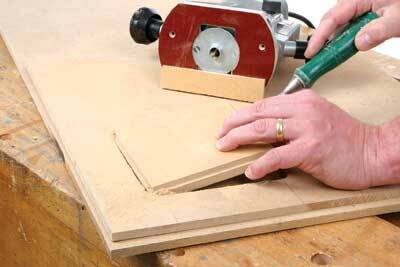 This is a really quick little project to make and involves very little cost in the way of materials. 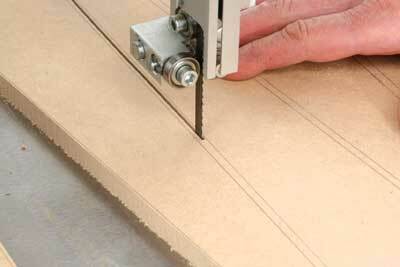 All you need are a few bits of MDF. 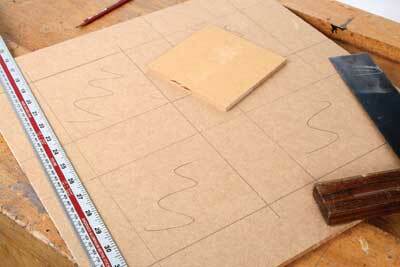 However, there is quite a lot of routing involved using templates, but this is not difficult and is a superb way to get consistently sized components, making it a quick and easy mass production technique if you're thinking of making batches of furniture for sale. Although MDF is a superb material to work with, remember that any machining operation produces vast amounts of very fine and unpleasant dust, so always take suitable precautions. I wear a respirator mask during the basic cutting operations and an air-fed helmet for the routing work, as this is a dusty process. This particular table was designed for a small bathroom, hence the use of the tiles, but you could easily modify it with a plain piece of MDF or even give it a solid wood top. 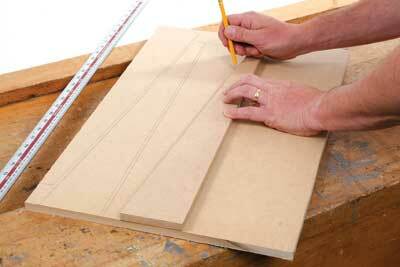 Start by making the leg template and use this to mark out the eight components required for the four legs. 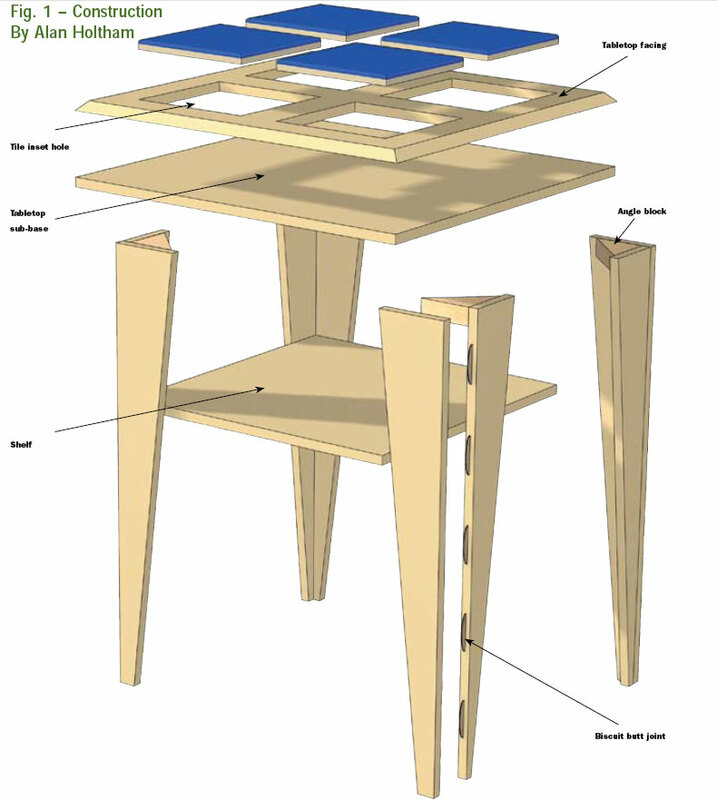 In reality, four of these need to be narrower than the others by an amount equal to the thickness of the material being used, but as I was only making one table it seemed unnecessary to make two separate templates, so I cut all the leg components to the same size initially and then reduced the width later. However, if you are gearing up for mass production, even small amounts of waste like this soon accumulate into significant amounts, so it is more viable to make proper-sized templates for each component. 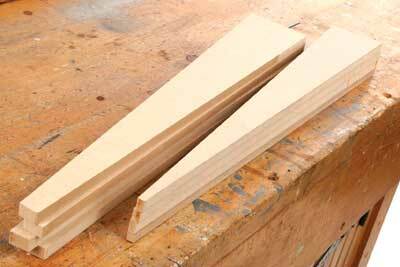 I used a bandsaw to cut out the legs, as the quality of the cut is irrelevant at this stage. 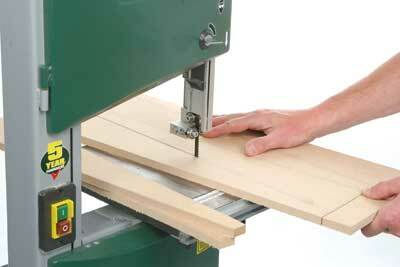 In fact, you need to cut them all about 2mm oversize, so the bandsaw is the ideal tool for this job. Don't make them too much bigger or the router will have to work that much harder to trim them to size later and you will also generate unnecessary amounts of dust. 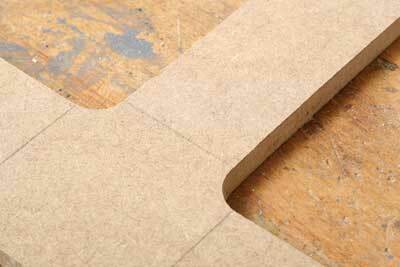 Stick the template onto the leg blank using a couple of pieces of double-sided tape, making sure it is centred to leave an even amount of overhang all the way round. For the trimming operation you'll need a bearing-guided cutter, and for this particular job I find the cutter with a bearing on the bottom is easier to use than one with the bearing on the top. 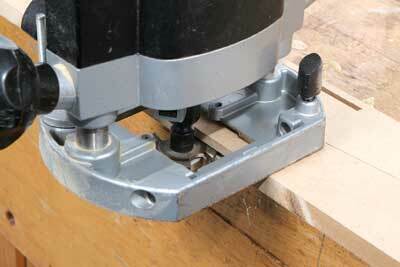 This latter type is better suited for use in a router table. With the leg and template combination clamped firmly to the bench, you can then run round the outline to produce a perfect replica of the template. Keep repeating the procedure for all the blanks and then cut a strip off four of them equal to the thickness of the material being used. 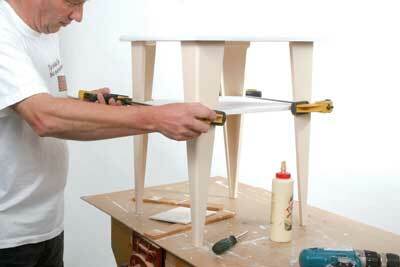 This makes the two sides of the leg an even size when they are glued together later. 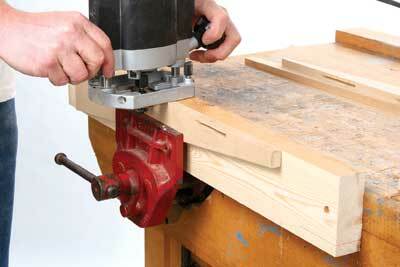 The simplest way of joining the two halves of each leg at right angles is to use biscuits, and once again you can use the router with a suitable slotting cutter fitted with a bearing. 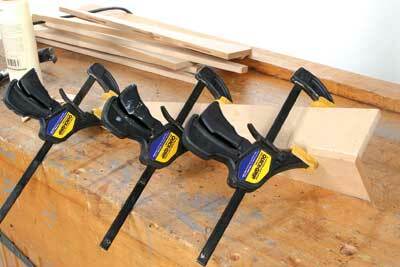 The narrower leg components are easily slotted as they can be clamped face down on the bench and still give plenty of support to the router. 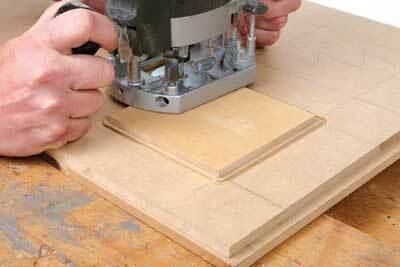 For the other half, which has to be slotted on the face, increase the support for the router by clamping it to a wider piece of spare material in the vice, so ensuring that you keep the router upright. Provided you don't change the setting of the router for the two components, they should fit together perfectly no matter where the slot is centred. Notice that I don't actually form the slot in the centre of the leg thickness, but move it well towards the inside to minimise the chance of exposing it later with the rounding-over cut on the corner. After gluing the two components together - plenty of glue in the biscuit slots will make them swell and grip properly - use plenty of clamps to pull the joints up really tight. 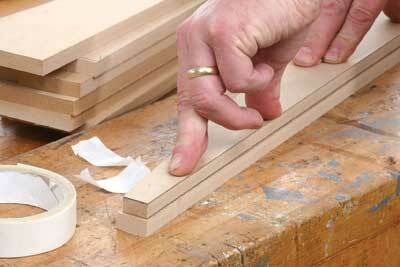 Once set, the legs can be sanded gently to make sure the joint is perfectly flush, but don't overdo this sanding or the surface will be much harder to finish later. 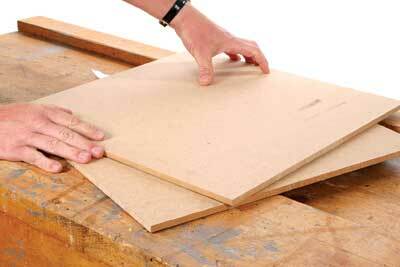 Sanded surfaces always seem to rough up more after painting than the original smooth MDF surface. 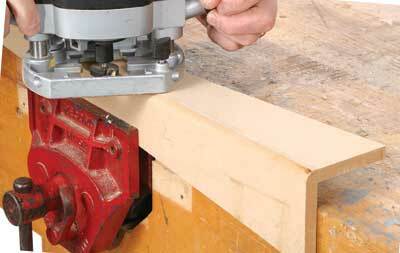 Now you can apply the rounding-over cutter down the corner of each leg - a simple job using a bearing-guided bit, but be careful that the router doesn't tip when you're working on the very narrow lower section of the leg. 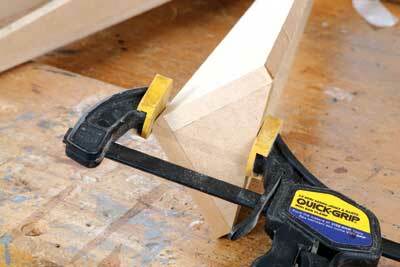 To finish off each leg, glue in a triangular support block at the top. 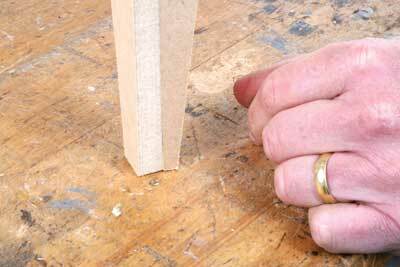 As well as strengthening the leg, this also gives you a means of fixing it to the top, so make sure it finishes perfectly flush with the ends of the uprights or it won't end up square to the top. For the top, I decided to set in some ceramic tiles to match those already being used in the bathroom, and there are various options for doing this. 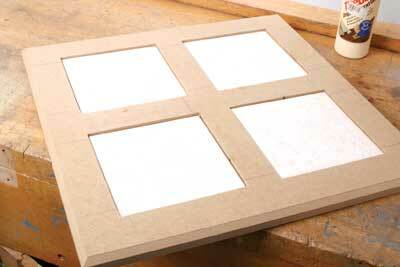 I could have used a single piece of solid MDF and routed out a hole for each of the tiles. Another alternative would have been to use the piece of thin material as a baseboard and then stick on strips around each tile to make up the required thickness. In the end I opted for a combination of both of these techniques and used two pieces of thin MDF, one as a baseboard and one with holes routed in it to take the tiles. 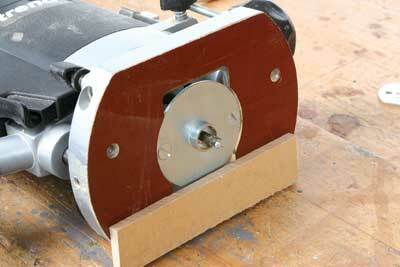 To achieve this you will need another template, a guidebush and a suitable straight cutter. 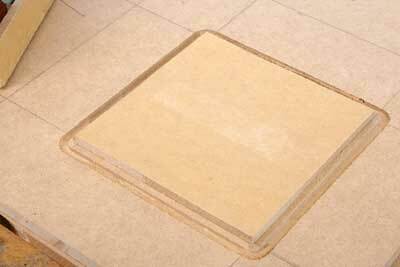 The first stage is to make a template of the correct size to form the tile recess. You can either make an internal or an external template, but in this situation I find it much easier to make and use an external template. However, you cannot just make it the same size as the tile or the recess, but must make allowance for the guidebush margin and the diameter of the cutter itself. The guidebush margin is determined by the following calculation: Outside diameter of the guidebush - cutter diameter over 2. ln my case this was 16-6 = 5mm over 2. For an external template you need to add on to this the diameter of the cutter, to give the amount that has to be subtracted from each template dimension. In this case each side had to be 11mm smaller than the finished tile dimension. 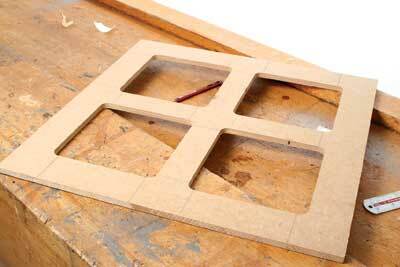 I used an actual tile to get the initial size for the template, and then reduced each dimension by 11mm. As the tiles are going to be grouted in, it is better to leave the recess slightly oversize to ensure they will fit, so make the template a fraction oversize. 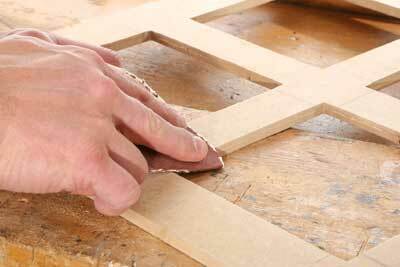 The position for each tile is marked out and the template stuck in place with double-sided tape. 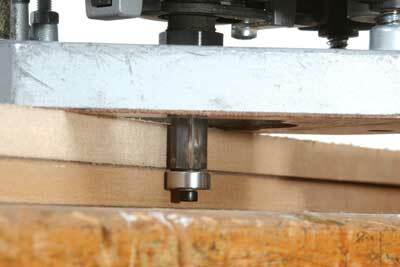 Also stick the workpiece to a sacrificial work-board so that when you plunge through and make the cut, the central offcut that you release remains secure and cannot move about into the spinning cutter. 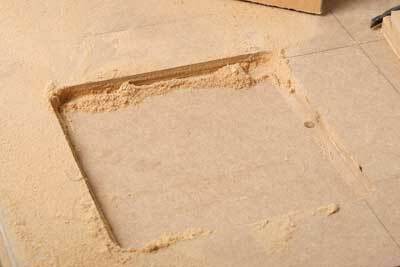 To prevent the router tipping during the template cuts, temporarily stick a scrap of the template material to the router base - the slightest wobble will be reproduced in the edge of the tile recess. 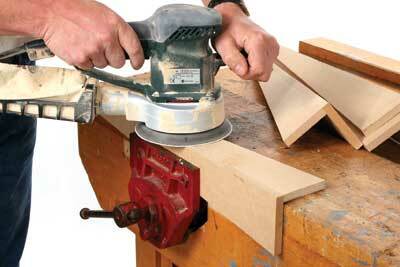 For an external template like this, work anti-clockwise to prevent the router wandering away from the template and make the cut in a series of shallow steps to avoid overloading the router or vibrating the cutter. Also, if you take light cuts, it is much easier to keep the guidebush in contact with a template, whereas if you have to start forcing deep cuts you can never be sure that this contact is being maintained. 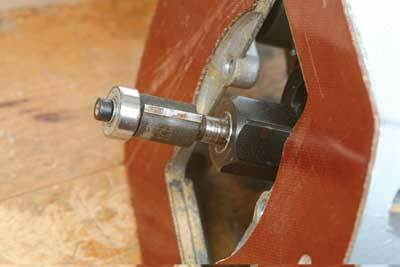 If you are working with an internal template feed the router clockwise. Once you've cut all round the template the centre can be removed by gently levering it off the double-sided tape using a flat chisel. Make sure the cutter only penetrates about 1mm into the work-board beneath as this is enough to leave a clean cut and should minimise the dust problem. 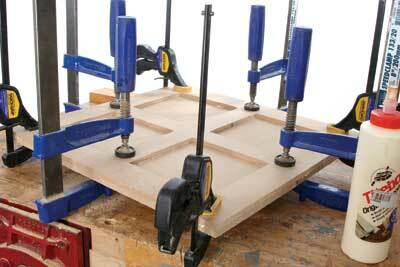 Repeat the procedure for all the other recesses by re-sticking the template in position each time. 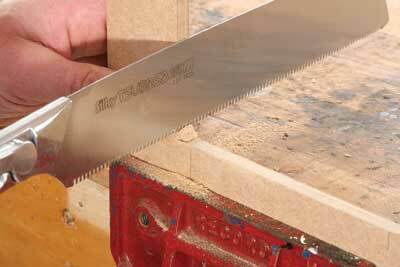 The corners of the recess are obviously rounded, but these are quickly squared out using a fine saw or chisel. 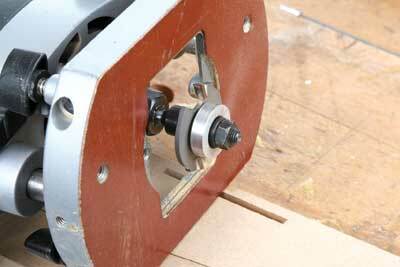 I also very slightly radiused the top edge of each recess using some fine abrasive paper. 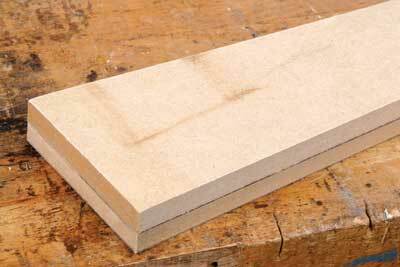 With all the cuts complete, you can now glue this top board onto the baseboard, but again clamp it securely to minimise the glue line. Check that the tile fits properly. Mine appeared to be slightly too thin for the depth of the recess but this was due to the finished material I had and any discrepancy was soon accounted for with the fixing cement. 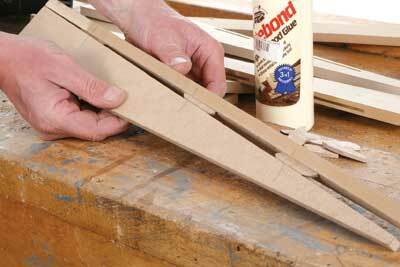 All you have to do now is cut a square piece of MDF for the shelf below and then paint everything prior to assembly. 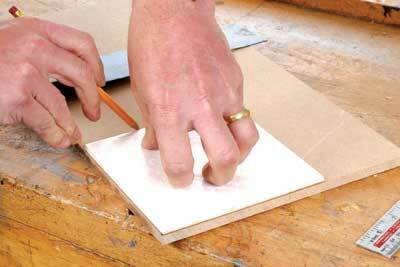 My preference for finishing MDF is to use an initial coat of undercoat, which has the effect of raising the surface slightly. Sand this smooth when it is dry and apply the colours of your choice. 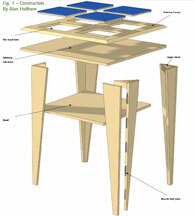 Assemble the table by screwing its legs to the underside of the top and then glue and pin the shelf in place, putting pins through each leg and then filling the holes with fine filler before a final touch-up with paint. 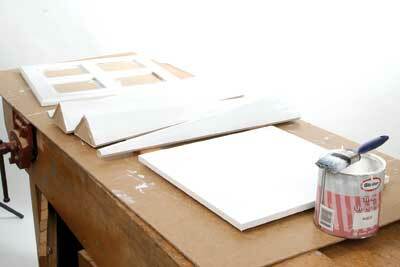 To improve the wearing ability of the paint surface, apply a coat of clear glaze. Finally, cement and grout the tiles in place. 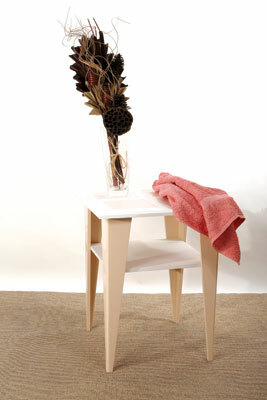 "This particular table was designed for a small bathroom, hence the use of the tiles"